Not since crates of tea were hurled into the Boston Harbor has anything made such a significant crash into Beantown's water. 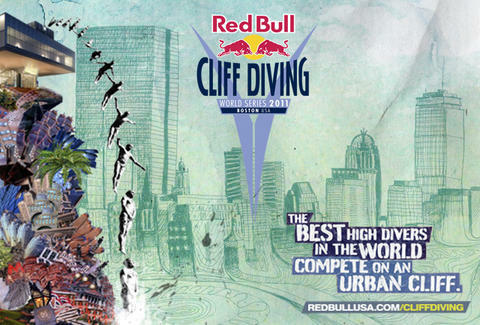 That is, until the Red Bull Cliff Diving World Series 2011 comes to the Waterfront this Sat, Aug 20th at 3p. The free high-diving event is the penultimate stop in an international tour, and the first time it's gone down in the middle of an urban metropolis. The wildly skilled divers will show off the glory of gravity as they jump from heights three-times as tall as an Olympic-regulation high dive, elegantly careening toward the water at speeds of 62 mph -- that’s acceleration faster than a racecar, and many other things that are palindromes. As if the height and speed weren’t nerve-quaking enough, the competitors will also be executing a series of jaw-dropping acrobatics as they plummet into the Harbor. Jump here for more details on the Red Bull Cliff Diving World Series 2011, which, being free, doesn't involve any taxation without representation.